We launched Zalyn back in Spring of 2012 to make it easy for travelers to save money on rental cars with relevant discount coupons. Today, we're pleased to announce the launch of our latest and greatest version to date (cleverly named Zalyn 2.0) & some of the cool new features we've added. Zalyn can now show you real-time pricing and availability for rental cars around the world. Wait, why exactly is this groundbreaking? Don't a gazillion other travel websites do exactly the same thing. That's right, but we go a step further and show you coupons that each rental car qualifies for. 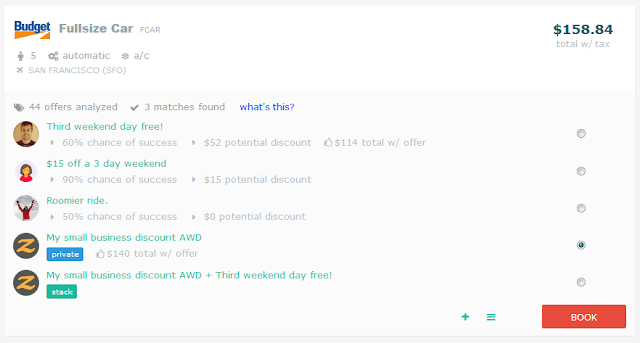 You can also see how many coupons were analyzed, number of matches found, chances that the coupon will work and how much you can potentially save. Ready to use one of the coupons? Simply select the coupon and hit Book, and you'll be on your way to book the rental car with the discount coupon. Its never been easier. We're grateful to our engaged users who take the time to add new coupons to ensure that our database is always up-to-date. As you may know, each coupon submitted to Zalyn goes through a review before its available for others to use. The review is typically done by someone on our team who checks out the details of the coupon to make sure the coupon is legit (there's a lot of bad apples) and applicable to the Zalyn community. We also ensure that the coupon is correctly coded (we frequently see submissions with the Rate Code and Coupon Code switched). Finally, the review process also filters out coupons that can't be verified (no webpage showing the coupon details and/or terms & conditions) or are not applicable to a substantial part of the Zalyn community (such as the IBM Employee Discount Code). However, some of you found this too restrictive and made some pretty good arguments. After a lot of discussions here at Zalyn, we're happy to say that you've convinced us to make a change. With the release of Zalyn 2.0, you can now submit all you favorite car rental coupons to Zalyn. If you provide a link to the coupon source and we're able to verify it, the coupon will be made available to everyone. However, if this information is not available, it'll still show up in your search results. You know what's better than a discount? TWO discounts! Some rental car companies allow you to combine discount codes and save even more. For example, Hertz allows you to combine a CDP code with a coupon code and enjoy two discounts. Alamo, Avis, Budget & National also play game. You can combine a coupon that only has a rate code (also known as AWD, BCD, CDP, Contract ID, etc) with another coupon that doesn't have a rate code, but has a coupon code (thankfully known as coupon code universally). The resulting stack is made up of a rate code and a coupon code. Now stacking discount codes is a great way to save even more, but its not something the average leisure traveler knows about. We're trying to make sure you don't miss out on any such opportunity, so every time you use a discount coupon, we ask you if it worked or not and how much you saved. If you say it worked, we'll check other discount coupons that've worked to see if we can combine them to create a stack. 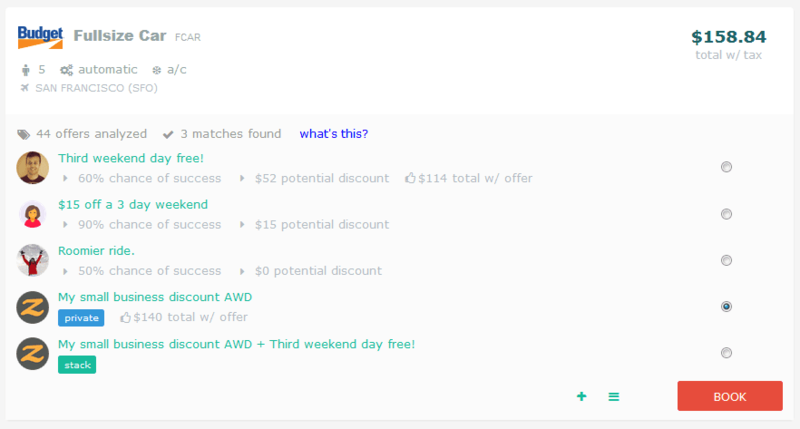 When a match is found, the coupon stack will show up and will be ready for use. The example below shows that the user tried the Third weekend day free coupon and reported that it worked. Similarly, the user tried the My small business discount AWD coupon and reported that it worked. Since both are compatible and can be combined into a stack, we create a "coupon stack" & show it at the bottom (tagged as stack). This coupon stack can be used the same way as the other coupons. We would love for you to try the new Zalyn for one of your upcoming rentals. Let us know how it goes. We look forward to hearing from you.